All images copyright Bryan Ilyankoff. All rights reserved. A passion for photography and the military, Bryan Ilyankoff graduated with his BFA in Photography from the Art Institute of Seattle in March 2015. Currently serving in the U.S. Navy Reserves as a photojournalist Bryan has been in the U.S. Navy for 12 years (eight years active duty and four years reserves) continually training and sharpening his media skills. Moving his skills forward, Bryan is currently training as a U.S. Navy Combat Photographer with Fleet Combat Camera Pacific in San Diego, California. During special holidays and events through the year Bryan also volunteers his time showing vintage military camera equipment with a World War II living history group traveling throughout Western Washington putting on static displays for the public. Since Bryan has now graduated with his BFA and he hopes to find full-time employment or possibly pursue a Master’s of Fine Arts degree in photojournalism while still serving in the U.S. Navy Reserves. 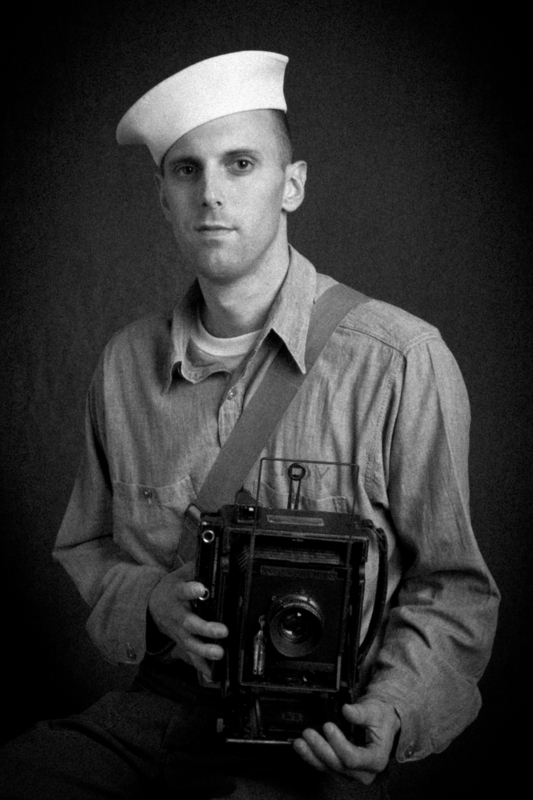 Me in my vintage World War II U.S. Navy Photographer's Mate impression with a period 4x5 Anniversary Speed Graphic camera.